Home › Knitting › Cerber-issy take 2! 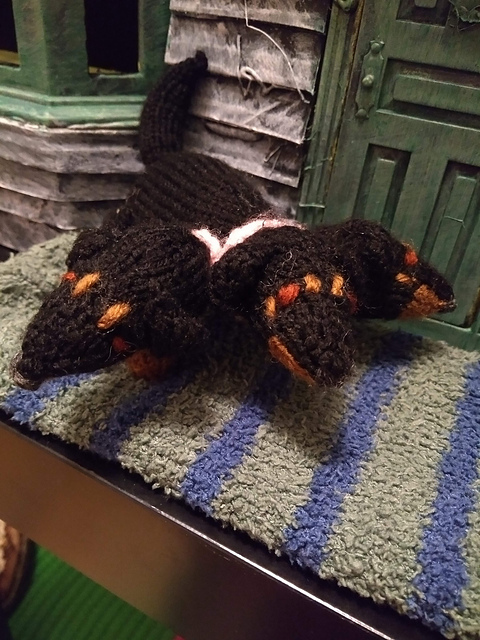 As mentioned on my last post, Felix wanted a Cerberus that looks like her favourite fur-cousin Missy! I will never tire of posting photos of that dog, she is so cite! Anyway, the first attempt of the Cerber-issy came out fantastic, but much too large. I heavily modified the pattern Husky Dog by Kath Dalmeny from her book ‘World of Knitted Toys’ and I must say, I’m really pleased! Not as detailed as the first, but still cute and it’s the right size! ‹ Cerber-issy – take 1! Haha, she’s absolutely fabulous! And I think makes a wonderful addition for the haunted house!